This week in digital piano news is yet another story revolving around a monster piano like the one in the film Big. 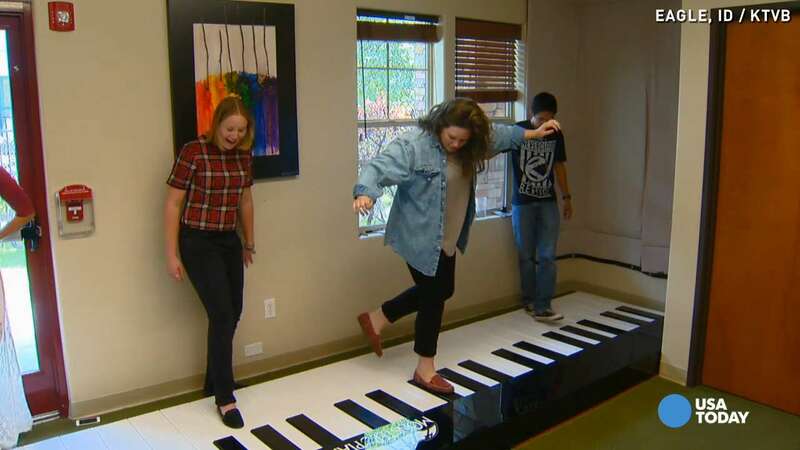 A music teacher from America has decided that as an effective learning tool, it is a great idea to have a Monster Piano in his front room. Monster piano was a must! The music teacher in question is Justin Neilsen, and he is the man behind Neilsen’s School of Music in Eagle. The music classes start every day with a circle of students and a cow bell (there are videos of these shenanigans on Youtube if you are intrigued enough to want to go and witness this spectacle). Before now, Neilsen’s School of Music had every musical instrument imaginable, apart from a monster piano to adorn the floor with digital joy. Obviously this hole in the musical instrument selection had to be filled, and a giant digital piano had to be bought. “I wanted one for a long time but never had one,” Neilsen said. “I remember back in the 80s when I saw Tom Hanks do it in Big,” said Neilsen. Following the immense success of the film Big with Tom Hanks, the FAO Schwartz big piano became almost as big as the movie “Big,” carrying a price tag that is also pretty huge at around $300,000. At this price, Justin Neilsen couldn’t possibly justify a monster digital piano, so the question was, where could he find a digital floor piano that didn’t break the bank? As it happens, the answer lay just down the road. Ken Cenell considers himself an entrepreneur, marketing almost everything — from magazines to laser printers to monster digital pianos. It took Ken six months to make his first giant digital piano out of wood and about a mile of wire. Now, it’s high-grade acrylic and sophisticated software. Cenell’s digital piano is also a fraction of what FAO’s big piano cost, roughly around $16,000. Thanks to this shrunken price tag, Justin was able to purchase the giant digital piano for his students. Previous Previous post: The Big piano hits Iowa!